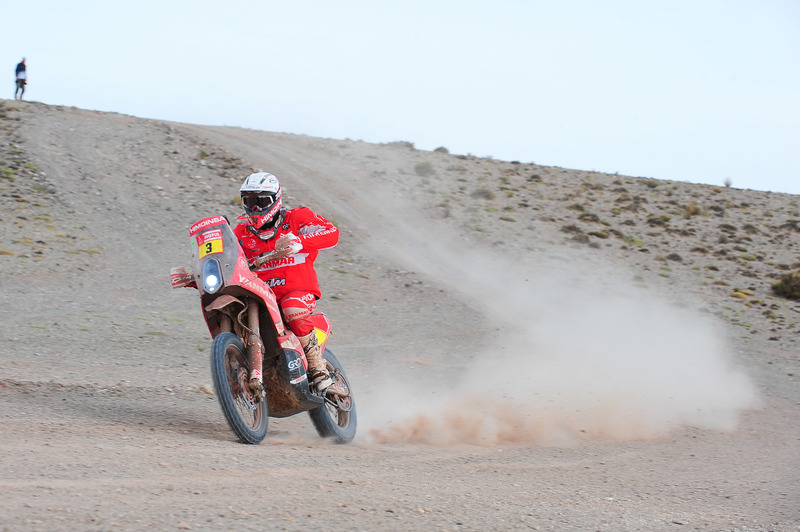 The HIMOINSA Team leader shocks the race after Dakar 2018’s most complex stage, and gets straight into the fight for the podium. Belén (Argentina). After the transitionary day which took the Dakar caravan from Bolivia to Argentina, the race was resumed with one of the most complex stages in this 40th edition of the toughest motorsports event in the world. Extreme navigation and some treacherous terrain has caused a true revolution among all the favorites. A scenario in which experience and impeccable technique allowed Gerard Farrés to shine bright and ride an exceptional stage. Despite struggling during the first part of the special to keep up with the very high pace of the official motorcycles, has applied all his knowledge in navigation and as well as the aeronautical techniques he was taught by the team director, Lieutenant Colonel of the Air Force, Miguel Puertas, to finish third on the day and take a giant leap in the general classification climbing up to fourth position. Like Farrés, the rest of the HIMOINSA Team riders stood out in this very complicated stage, with Dani Oliveras in eighth position, Marc Solà, sixteenth and Iván Cervantes in 24th place. Meanwhile, Rosa Romero continues unstoppable quest towards Córdoba’s finish line and has completed a new stage.